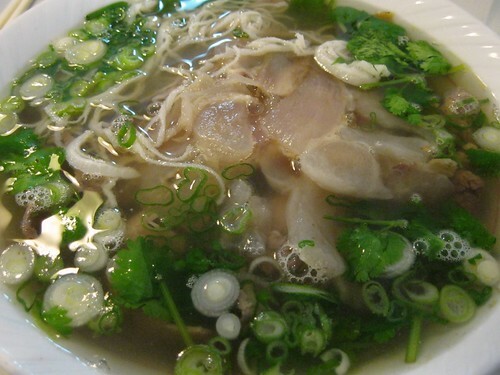 Might As Well Face It, You’re Addicted to Pho… | Hapa...Shot the Food! Well… I’m not nearly as addicted to it as Anthony Bourdain is, but it’d been a long time since I had pho. I began craving the Vietnamese beef noodle soup again late in the Spring. 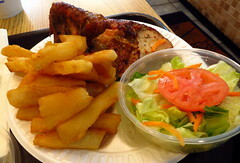 We were heading to Fairfax, VA to help out at a National High School Quiz Bowl Tournament the first weekend of June, so we searched for nearby pho places online. We then found Pho 75 in Falls Church, a highly regarded local chain located not too far from where our hotel for the weekend was located (admittedly the only other place I had pho: twice at Nam Viet/Pho 79 in DC’s Cleveland Park neighborhood). Set in a strip mall and spartan in decor, Pho 75 does only one thing, but it does it very well (like all of its sister locations, no doubt). Our pho came out quickly along with a platter of bean sprouts, lime, basil, and peppers. Siracha (a hot chili sauce), plum sauce, and fish sauce were already on the table. Dan’s Pho was the #4, which had rye-of-round, flank steak, well-done brisket, soft tendons, and tripe. Mine (#1) had all of that. Instead of well-done brisket, I had fatty brisket in my soup. I put in a few drops of the siracha, squeezed the contents of a lime wedge in, and topped my pho with bean sprouts (pictured below). As shown in the topmost picture, Dan opted to put basil in his pho. “She put the lime in the pho, you nut…” (with apologies to Harry Nilsson). Despite it being a warm late spring day, I gleefully finished my large bowl, and Dan finished most of his, if not all. The mixture of beef, veggies, and noodles (and accompaniments) provided wonderful flavor, and the parts that were atypical in an American soup (tripe, connective tissue) also provided for a good contrast of textures. At the time of the afternoon we visited, it wasn’t busy, so we were in and out relatively quickly. Of course the pho hit the spot, and it was reasonably priced (a large bowl runs in the 6-7 dollar range). While there we found out that if I have another craving for pho, we need not travel so far, as there is a Pho 75 on University Boulevard. 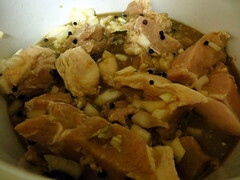 Posted on July 15, 2010, in Asian, eating out, Uncategorized, Vietnamese and tagged pho. Bookmark the permalink. 1 Comment. 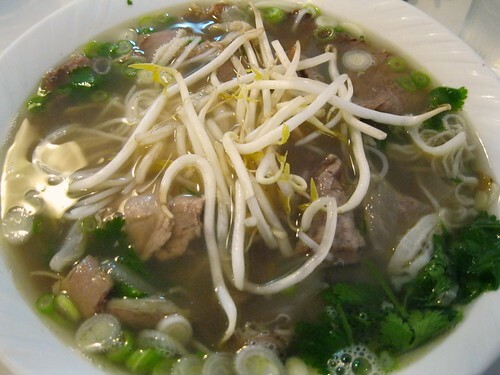 I love Pho too, but only tasted the ones in the Rockville area. 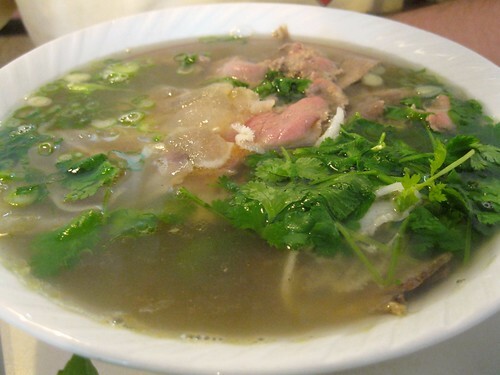 I heard there’s a big Vietnamese area where there’s tons of Pho places there in VA.